Wild: Stegosaurus regium has approximately 16 paired rows of plates along its back, flanked by another smaller pair of 6 plates. This is contrary to the alternating rows of Stegosaurus fossils found in museums. I’ve encountered Stegosaurus, in varying amounts almost everywhere on the island. Domesticated: Commonly used as a safe way to transport large quantities of goods. The plates on the Stegosaurus regium double as a cover against the arrows of the attackers. Unfortunately, they also make it harder to load and unload some cargo. The Stegosaurus attacks by swinging its spiked tail at the opponent, which has a wide area of attack. Care must be taken not to anger any nearby dinosaurs by accidentally hitting them. The swinging attack, however, is excellent for collecting large amounts of berries. 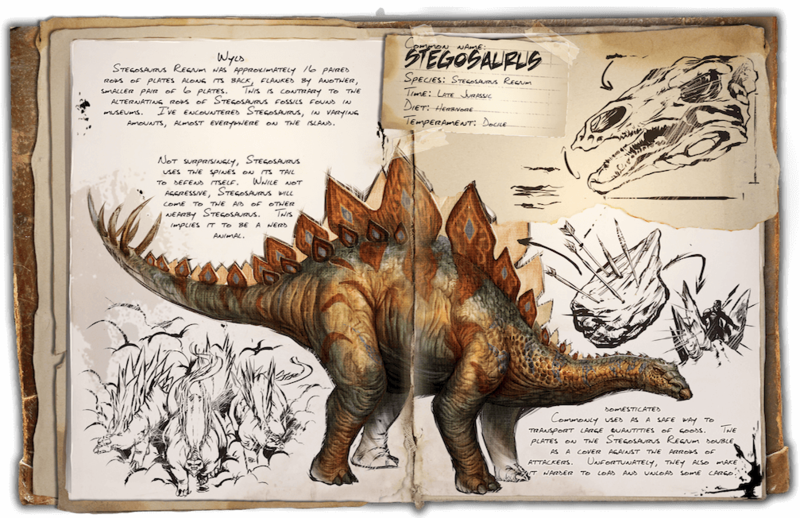 Known Information: Not surprisingly, Stegosaurus uses the spines on its tail to defend itself. While not aggressive, Stegosaurus will come to the aid of other nearby Stegosaurus. This implies it to be a herd animal.